The other day I was making this vegan Pasta Primavera for dinner when it hit me: this dish embodies everything I believe vegan food should be – easy, quick to make, tasty and healthy – so it would be unfair to not share this recipe here on the blog! In fact, I’ve been making some variation of this pasta quite regularly because this recipe always saves the day whenever I’m too tired/lazy/pressed for time to make a more elaborate dinner. Plus, Rob being half-Italian is a big fan of pasta! The hands-down awesomeness of this recipe is that it’s very customizable depending on what ingredients you have on hand. I like it with spaghetti, but any pasta shape will do. Fresh veggies are great, but if you don’t have a lot of them, you can easily use a bag of assorted frozen vegetables in a pinch. Store-bought pasta sauce will work if you didn’t make a batch of all-organic, superhealthy homemade sauce last weekend – we ain’t no superhumans, are we? 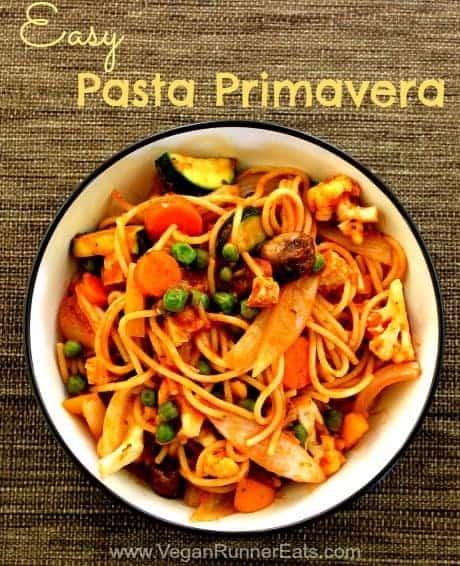 One or two cooked and cubed chick’n patties make a nice addition to this Pasta Primavera. In case you choose against using Gardein patties, you can always substitute them with baked tofu – here’s how I bake it with no oil – or just plain ol’ cooked beans. Here’s a trick I’ve been using lately to make sure the cooked vegetables stay nice and crisp: I’ve been cooking them all at once in a wok! Yep, that deep pan with a domed lid can make Italian dishes with the same success as Asian stir-fries. I currently use a wok we bought at Ikea, but the good ol’ Amazon is lousy with great wok options . If you don’t have a wok right now but decide to buy one, make sure you get one with a lid: magic happens to your favorite veggies only when a wok is covered up. Added bonus – you save quite a bit of time when cooking vegetables all at once in a wok, plus stirring them is a breeze because woks tend to be pretty large. In the recipe below, I show you how I manage to throw this dish together in only 15-20 minutes. A little multitasking goes a long way here! This easy pasta dish is chock-full of vegetables, fiber, and whole grains. It’s easy and quick to throw together at the last moment when you don’t have lots of time to cook dinner. - 3-4 cups chopped fresh vegetables of choice – onions, carrots, broccoli, cauliflower, mushrooms, bell peppers, etc. Wash vegetables and chop into bite-size pieces. Bring a large pot of salted water to a boil. Cook the pasta to al dente according to the package directions. Drain, set aside and keep warm. Heat up a wok, spray it with cooking spray (or use 1-2 Tbsp of water or broth). Add fresh vegetables, cook covered with a lid for 3-5 min, stirring occasionally. Pour pasta sauce into a microwave-safe cup or bowl, cover with a paper towel, and microwave for 1 min. Once the sauce is hot, add it to the vegetables along with the cooked and chopped chick'n patty (or baked tofu/beans), minced garlic and frozen peas.Stir to distribute the sauce. Add the pasta to the wok, stir to mix with the vegetables and the sauce. Serve sprinkled with red pepper flakes if you like it spicy. Enjoy! Question: What’s your favorite dinner recipe you make in the summer? Like this recipe and want to see more? Stay in touch with Vegan Runner Eats by subscribing in the top right corner of this post, or by following the blog on Facebook, Twitter, Google+ and Instagram! 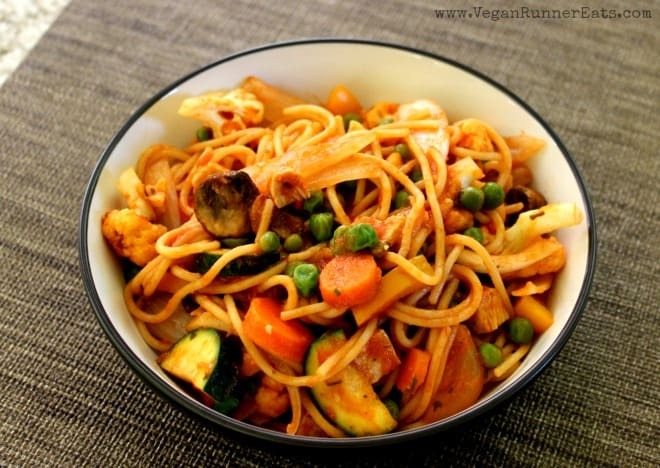 Tagged Italian, pasta, plant based diet, quick recipes, vegan dinner, vegetables. Bookmark the permalink.